With the Big 4 Day Epic looming l needed to get in some distance rides on terrain that would mimic that Keith and I would ride on the 12th of July from Pooley Bridge in the North Eastern corner of the Lake District in Kentmere, the Howgill Fells then southeast into the South Yorkshire Dales aiming for every high pass in our way. My riding conditioning was in need of a boost and the only way to do so would be to ride long and high. The Tour of Helvellyn is a well known classic ride, not classic in the sense you can see it off after a day in the office way, but classic in that it represents a purist lakeland ride that has a bit of everything. Steep rocky packhorse roads a well graded coach road and busy lakeside roads whizzing with tourists. My attempt on this route was a solo effort which I enjoy sometimes when I know the going is not exactly what one would call a good ride but simply getting around and completing the tour not always sat on the bike but rather underneath it as required for the first third of journey. 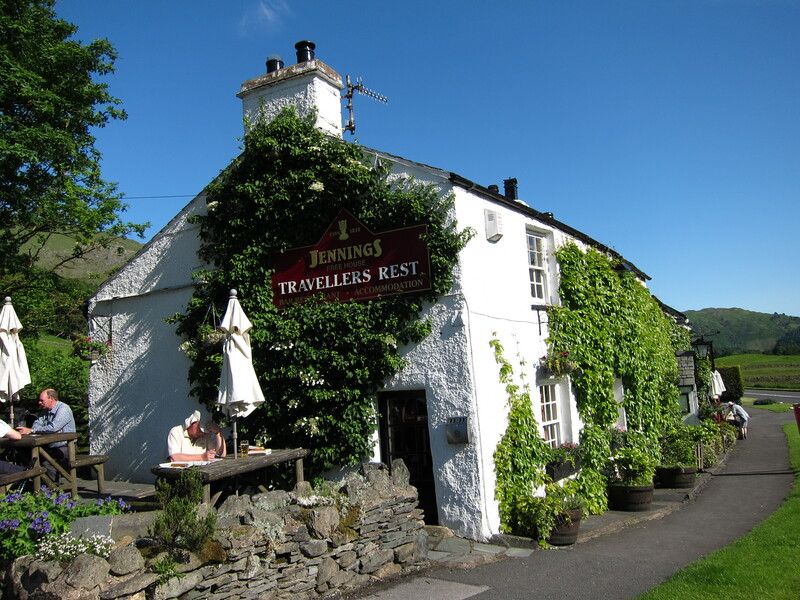 I parked just north of Grasmere at the Travellers Rest pub on the A591on the provision I would have a drink and a bite to eat to the sum of £5 when I return. Fairly doos I thought and took a raffle ticket and popped it on the dash hoping it doesn’t get pulled out the hat. 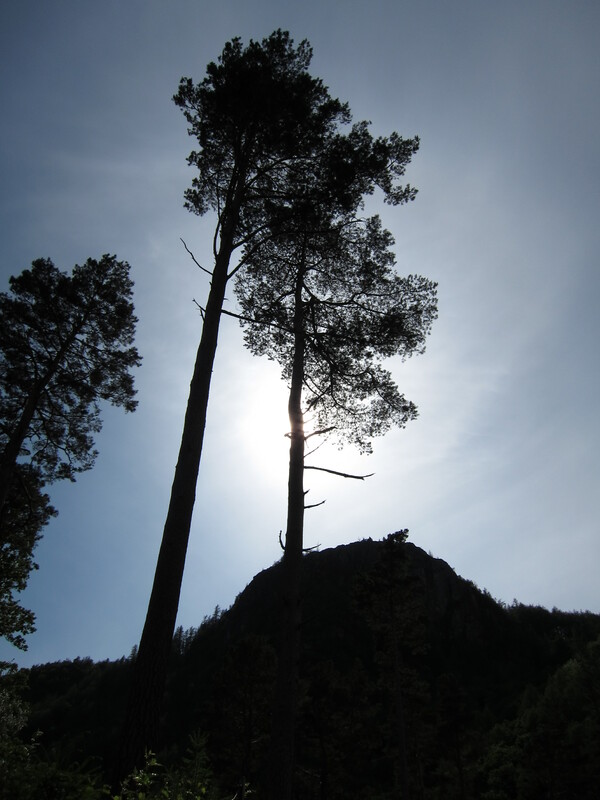 I set out in search of a good bridle path that turned right and climbed steep. No messing here opting for granny ring immediately just to spin the legs into a gentle warm up and grind out the ascending stoney track towards Great Tongue following Little Tongue Gill. The recent weather that has remained wet since High Street has gills and becks gushing white with rain falling from the fells feeding the lakes around either Grasmere or Thirlmere. The gradient steepens to G.O.A.P (Get Off And Push) status. No amount of hanging on the bars will keep the front end down so I resort to pacing out the climb it stages. This scenario always reminds me of the climb up Bram Rigg in the Howgill Fells to the Calf. Killer! The stone trail fades to that kept grass that only sheep can offer. I use the footsized steps to get a grip on the hill and begin to feel the effects of what can only be described as a full body work out pushing my bike decisively through my legs and chest out through my arms. I’m assessing the magnitude of the climb and how much is left of the ride after what is an incredibly slow start to a long day and imagine what time I would get round to Thirlmere. It seems like ages away with some much mountain before me. 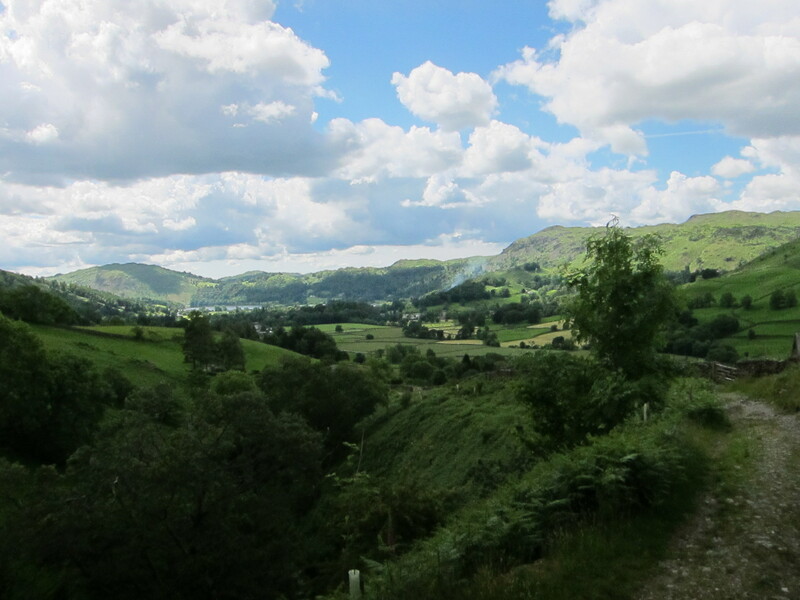 The only indication of progress here is clear when looking back to the view of Grasmere which looks very inviting. I think about lying in the park with a book and a beer. The track turns stoney but this time it’s knarley and the pace remains slow keep you from gaining enough speed to carry you across the roughest sections. 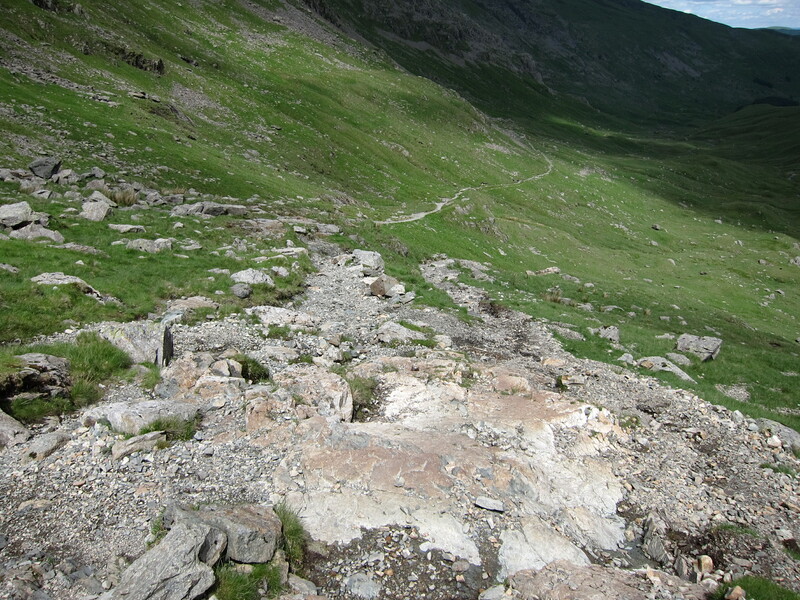 The scree from Seat Sandal is responsible for what makes you think, “what’s the point of this again”? I revert to rolling to a stop and pushing before I can ride to the next unridable boulder field. It’s not a bridleway really. It’s not a path if only for the fact it’s a series of green dashes on the map. I hoist the bike onto my back as more rain falls from under my helmet, it’s head down to start the hike a bike section up to the highest point of the ride through Hause Gap below Seat Sandal to Grisdale Tarn. The role is reversed and I’m taking my bike for a walk because it’s given up and doesn’t intend to turn another wheel until we head down. Typical! Grisedale Tarn from Hause Gap looking to Ullswater – A banana stop. 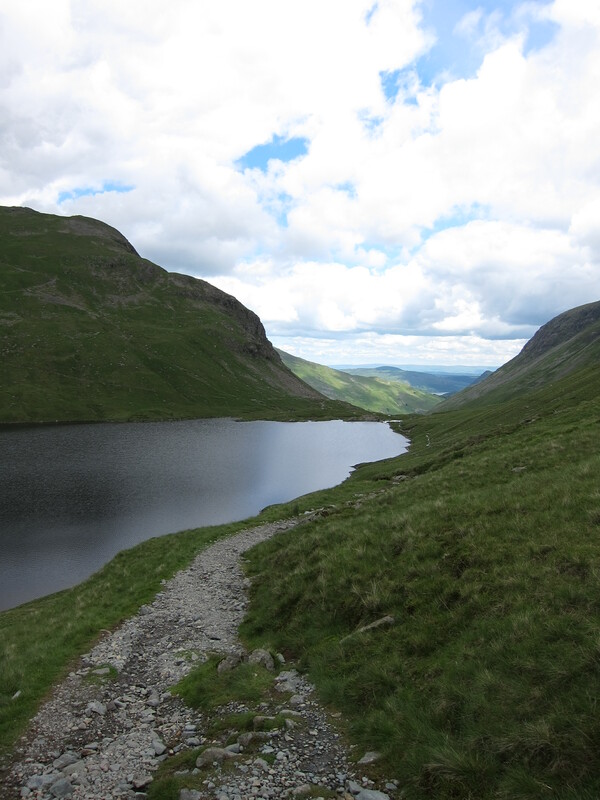 Despite the grueling climb and lack of any proper riding I’m lifted by the view of the cool looking tarn. The sky is a mix of broken grey and white clouds occasionally interrupted with blue but not nearly enough to make a pair of sailors trousers. Just a matter of line choice eh? promise of an equally major screaming downhill. From Grisedale Tarn the trail looked good . 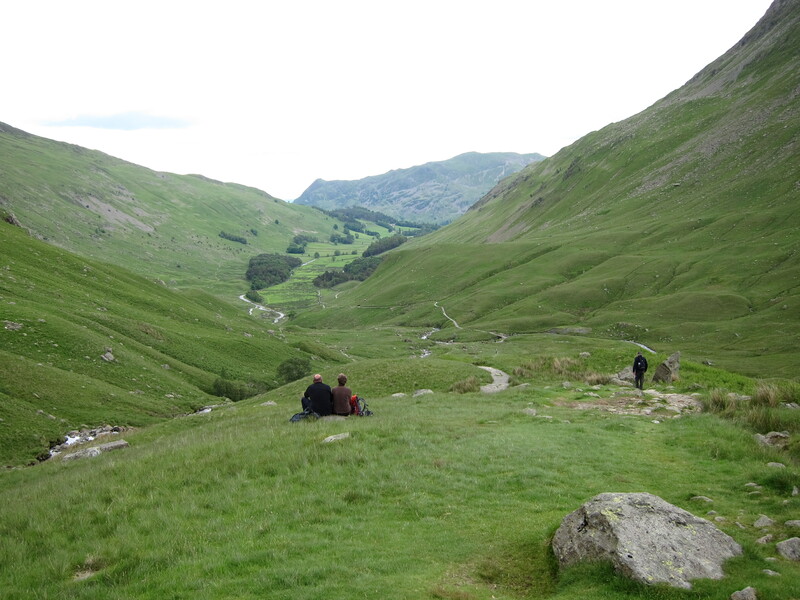 I can remember years ago riding from the side of Dollywagon Pike on my rigid Cannondale m300 (in mango). Yes is was hard going but i was new to riding then and now after 17 years and some upgrade to riding machinery I could make a better go of this descent. At least that’s what I had in mind. Either my memory has been romanticised over the years or it’s just plain poor, or this trail is now more technical. Do we say technical for those parts of the trail we can’t or won’t ride? The parts where we don’t dare clip in for fear of bailing it onto something that would not only hurt but would put you out of action for a while. This was not my intention today. Live to ride another day is my motto. Beside I had a big ride ahead next month and accommodation is booked an paid for. As I surveyed the trail ahead I was met with regular should I or should I not moments, do or dies that that begged the question. What would Gee Atherton do here? Could he ride it. I figured he could but as I shouldered my bike down through the boulders and steps. When I say steps I don’t mean a tidy line of equal sized treads and risers, but steps that had be kicked about forming no discernible line to choose. I stood looking at the next place to put a foot. I was convinced Gee Atherton would at least find it tricky and if he took a tumble then I’d have to say I was right to walk this part. 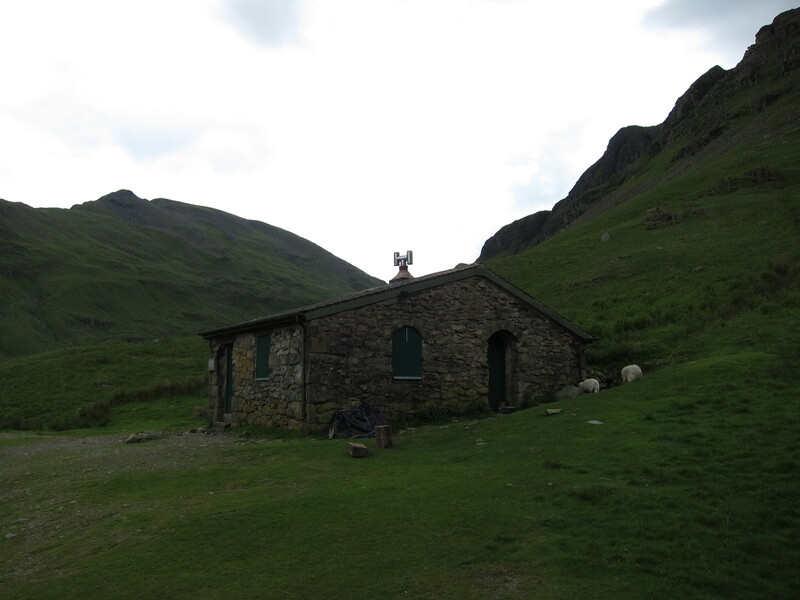 Ruthwaite climbing Lodge at 373m. Sure enough at this point I confessed to have carried my bike further than I’d ridden it. Reluctantly known as Dismountain Biking. Technically this was not true it just felt like it. I was eager to make some progress with my wheels under me and hoped for a trail to ride on. At Ruthwaite lodge (climbing hut) I took another break. The trail ahead did look civilised in that it was actually man made. A bumpy supersized cobbled path punctuated with rain channels. The path was steep and required a large amount of weight over the rear wheel as the front did it’s best to dive and send me over the bars. A new found technique that seemed to work well was the pedal slowly in a high gear with the back brake lightly applied. It felt strange to be pedaling down a path this steep in this way but was satisfying in that I was at least riding at last. The start of “the ride” the end of the walking. 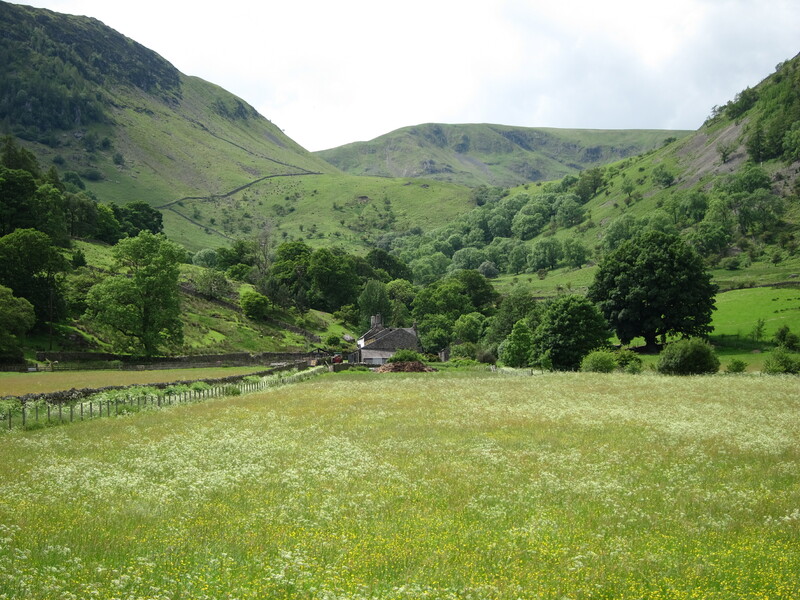 From Ruthwaite Lodge along Grisdale Beck to Patterdale. Place Fell is seen through the valley. 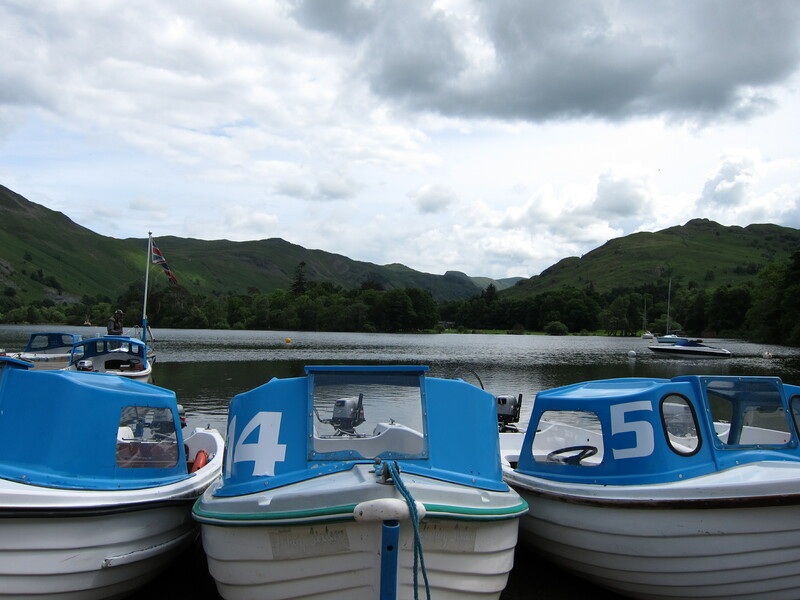 The ride now was a pleasant cruise in Patterdale. From super knarly to clean buff broad track with a few gates thrown in. 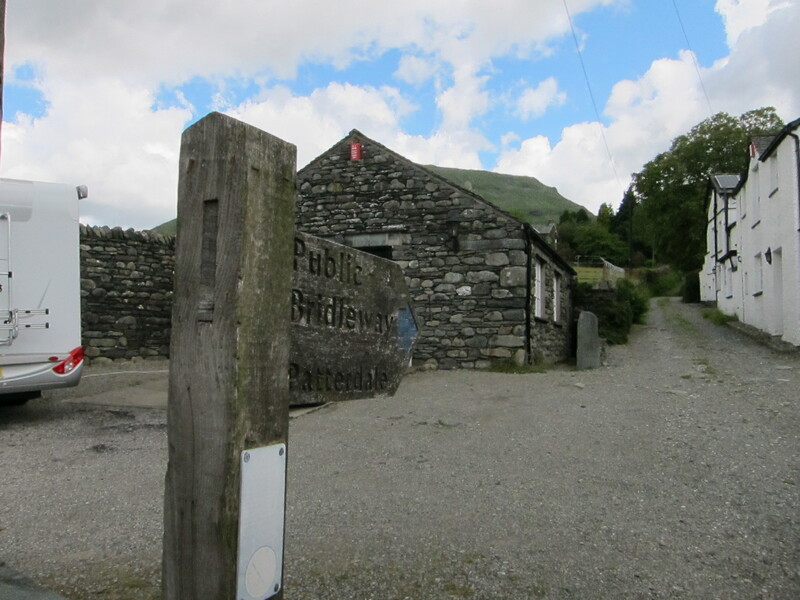 One extreme to the other, but fast approached Patterdale and Glennridding where I pulled into a fine coffee hut opposite St Patrick’s Well on the shores of Ullswater. I shared the moment with a few tourists taking in the tranquility of the day. A coffee and my own Soreen to replenish lost vitals to set me up for the next stage of the ride. A road section on the A592 along the shores of Ullswater to pick up the A5091 turn climbing toward Dockray. 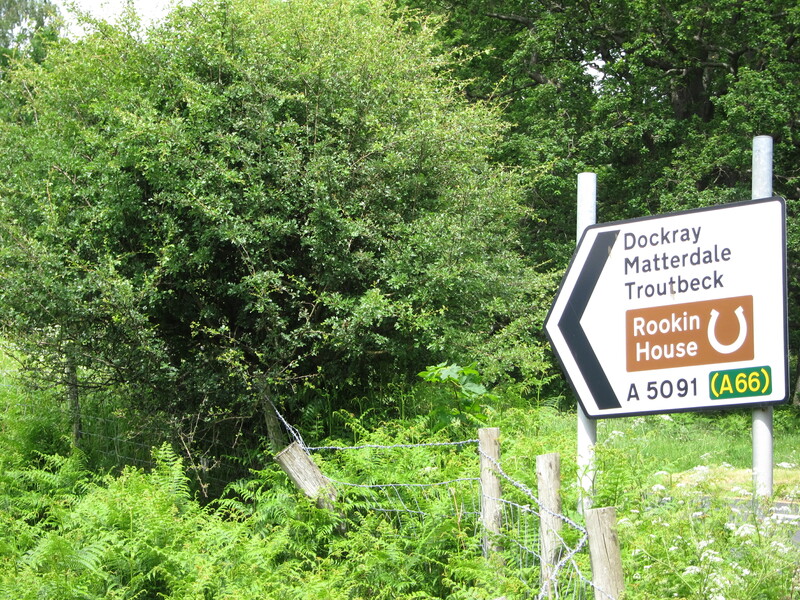 The road to Dockray is a slow climb and but offers up great views of Ullswater. From Dockray I turn left at the pub through High Row where the Old Coach Road can be joined. I met a three mountain bikers taking break here and stopped for a natter. Typically the chat was centered around the disappointing summer we’ve had. They were on the way to Keswick planning to use the Old Coach Road too. I set off and they followed shortly after. 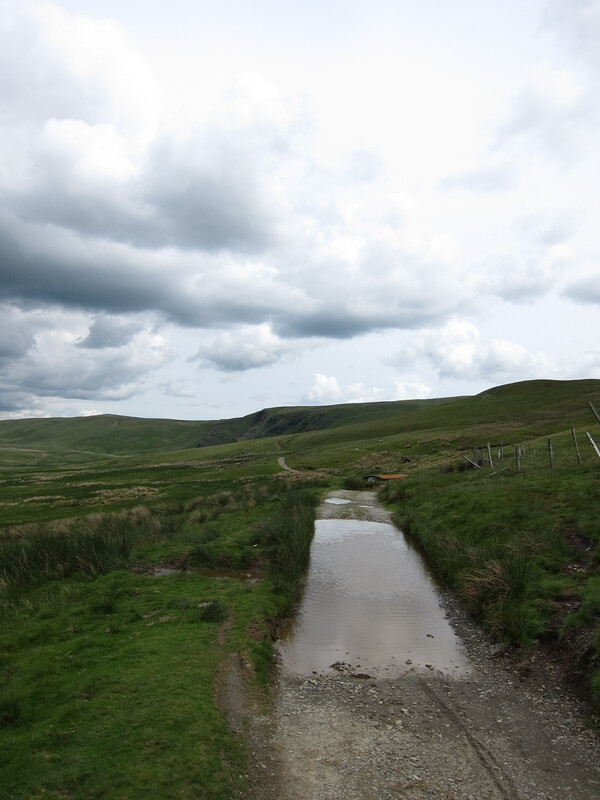 The old coach road is a well graded track it remains relatively level as it contours below Clough Head but evidently it’s well used from the resurfacing work taking place, but probably more to do withthe heavy and persistant rainfall suffered in the recent weeks. A heavy digger trundled along taking up the full width of the track. There was more work to be done as puddle after puddle appeared, deep to the pedals were a measure of the heavy rainfall here. This should have been a hard packed dusty road. I promised myself a return when it dried out, if ever. 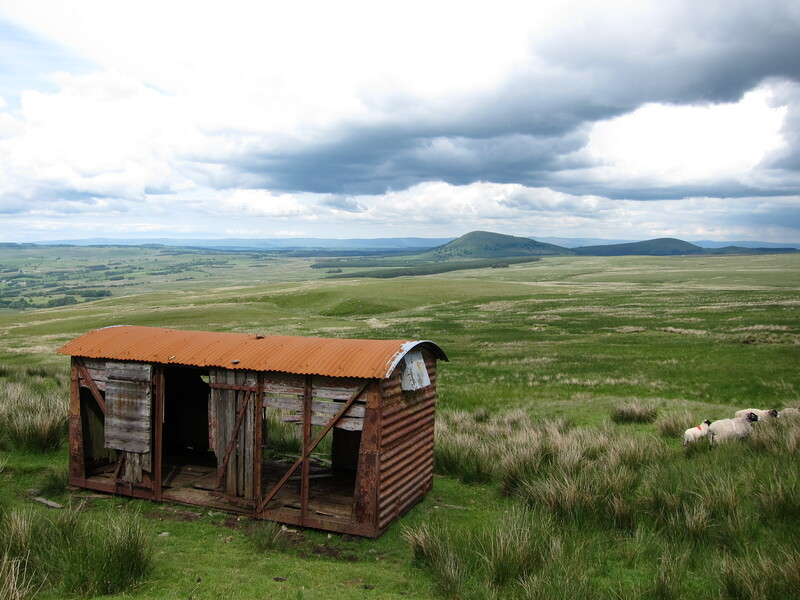 There are good views of the North Pennines to the north east with little in the way . Great Mell Fell and Little Mell Fell the last of the Wainwrights signifying the edge of the Lake district. Clicky this link for some HD video… Eventually the road begins to descend and dirt and puddles give way to hard stone. Gravity builds and builds as the track opens on the approach to Thelkeld common. Blencathra is massive to the right and my ride is now nudging grin factor ten as I’m blasting down Hauswell Brow. It’s on trails like this where I feel the Nomad works best, encouraging me to leave off the brakes and attack the descent. It’s a brilliant trail and I’m buzzin at last. I arrive at Wanthwaite and grab breath totally pleased with myself and in love with the riding today as the slog of the previous hours blend into the experience of the whole ride. 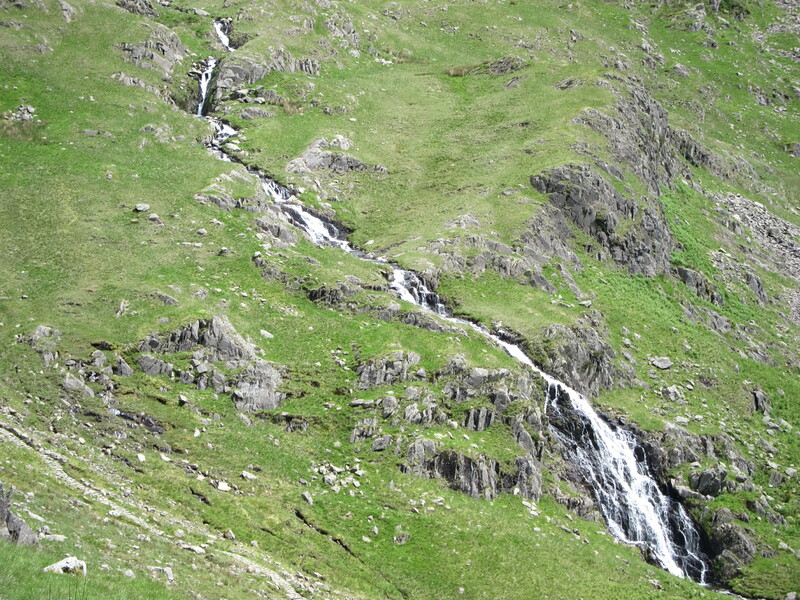 It’s a Tour of Helvellyn. It’s got it all. I descide the tour has three experiences. 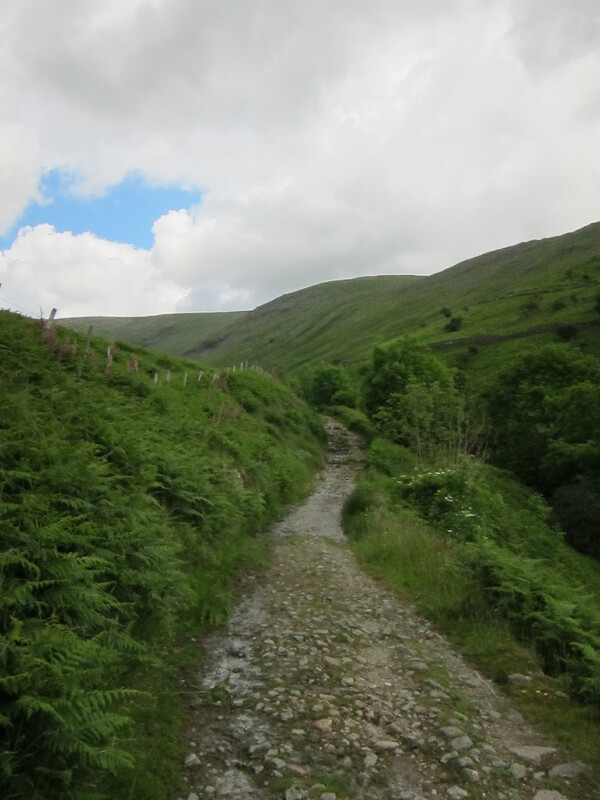 The first is a hard and frustrating grind to Patterdale. 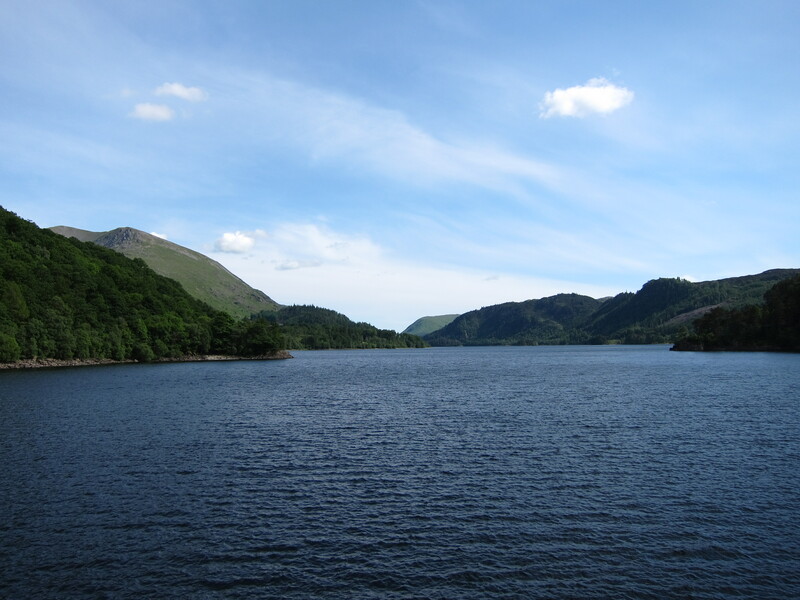 Secondly, pleasant, fun and adrenaline fueled to this point where the third section begins as a tame and tranquil road ride around the back of Thirlmere Reservoir. 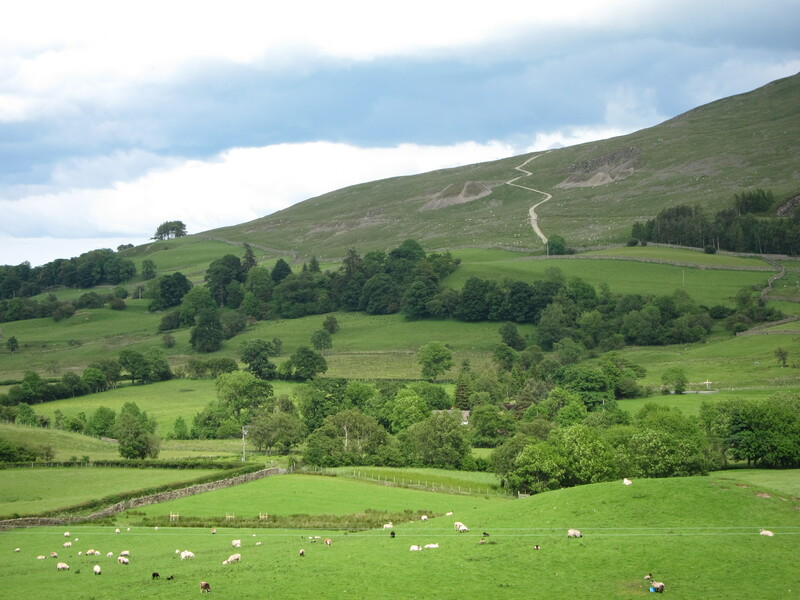 I pick up the grassy single track bridleway at the Foot of High Rigg through St John’s in the Vale. It’s a roller coaster trail of short up and down blasts. A good workout for the fingers and thumbs as well as the legs. The weather now was ideal. The sun was out. I was reveling in the surroundings taking a step back for the riding giving more time to look around. At Sosgill Bridge the bridle way comes to and changing to a footpath so I turn left onto the B5322 as far as the Green where I cross the A591 and head for the dam, the head of Thirlmere Reservoir. 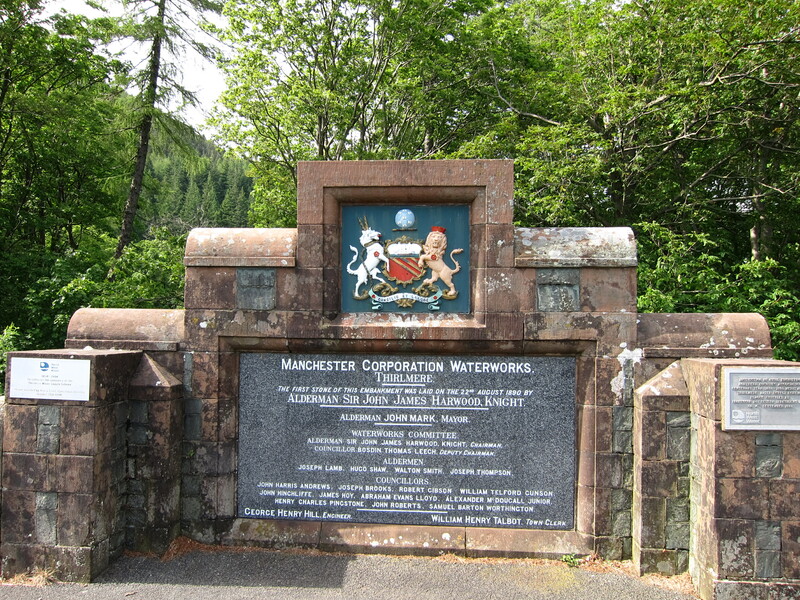 The Reservoir was built in the 19th century to supply Manchester with water to keep up with the increased growth of industry. 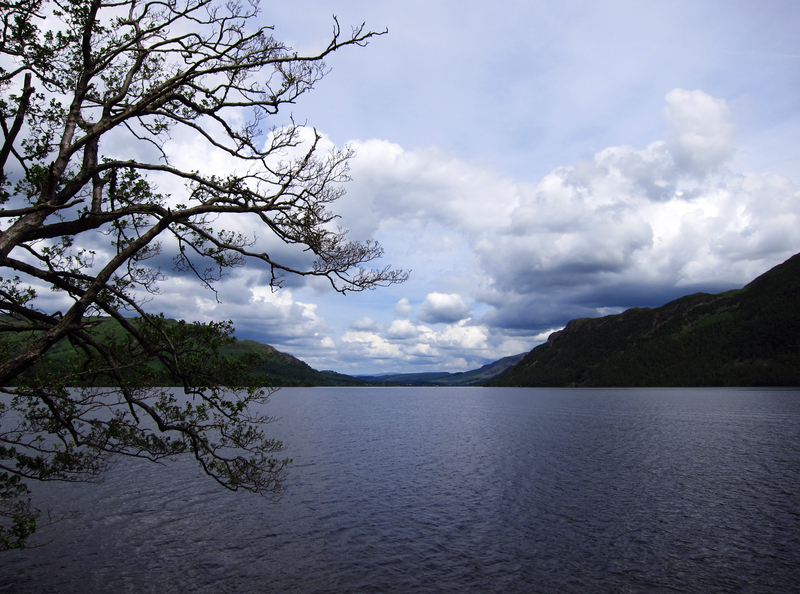 The reservoir and surrounding forested valley is owned and managed by United Utilities, a private water and waste water company. From here the sun dipped behind the fells that make oy the likes of Bleaberry Fell and High Seat, I decided to take the quieter back road the edges around Thrilmere. I nice meandering section of tarmac if the was ever such a thing. 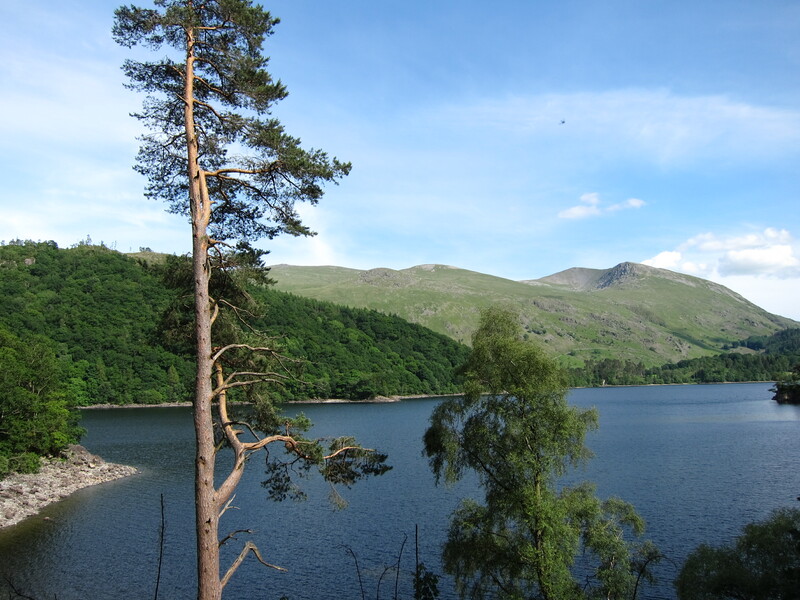 Actually after the strains of the day I didn’t mind the easy road back to the Travellers Inn espcially as I could look across the reservoir to admire the back of the Helvellyn range, the Dodds and Helvellyn itself lit brightly by the late afternoon sun. Overall I was feelling very pleased about how I faired against the test of this tour. It was intended to bench mark my riding condition and I was now confident that I could attack the 4 day epic dispite what it had in store. All I needed to do now was continue to putin some regular distance rides from home and I’ll be ready. I finished the day with £5 odd worth of goods from the Travellers rest in exchange for parking there all day and took home a snickers and bag of crisp and some nuts. Should have gone for the cream tea.